September 19th marked the opening day of the world’s biggest beer festival, also known as a brew lover’s nirvana. Hoping to make the journey to Munich for next year’s Oktoberfest? There are some things you should know. Fortunately, Oktoberfest’s teeming crowd of millions is tempered with an equal amount of beer. But there’s actually more to the 16-day celebration than standout suds. The historic German festival is an unforgettable blend of tradition and good-natured revelry—washed down with a hearty chug. 1. 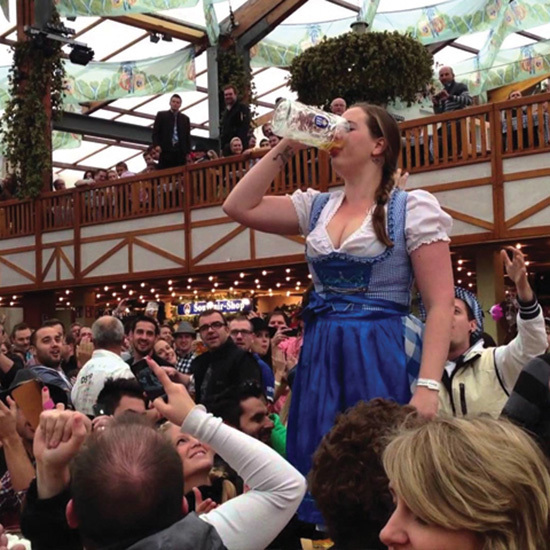 OKTOBERFEST HAS BEEN RAGING FOR OVER 200 YEARS. Munich’s first Oktoberfest took place back in 1810 in honor of Bavarian Crown Prince Ludwig’s wedding to Princess Therese of Saxony-Hildburghausen. The royal celebration included a public feast and horse races as entertainment, but the suds didn’t start flowing until 1819 when the annual races were replaced with beer vendors. The meadow where Oktoberfest happens was named Theresienwiese after the princess, and today locals refer to the event simply as Wiesn. 2. IT SHOULD REALLY BE CALLED SEPTEMBERFEST. Why is it called Oktoberfest when it starts in September? Fair question. While the very first celebration lasted only a week, it wasn’t long before the joy-inducing Oktoberfest stretched into a 16-day affair. Germans party hard: Who can blame them? Festival officials chose to move the start date up to take advantage of September’s warmer weather, a decision that has encouraged far greater attendance. We’re talking 6.4 million visitors each year. 3. THE PARTY DOESN’T START UNTIL THE MAYOR TAPS IN. The fairgrounds may open at 9 a.m., but you’ll have to wait until the official tapping before curling your hands around a signature stein. That process begins at 11 a.m. with the procession of breweries, brass bands and the mayor to the Schottenhamel, the festival’s oldest beer tent. At noon, to the tune of a 12-gun salute, the mayor taps the first beer barrel and shouts “O’ zapft is!” Once the first beer is handed to Bavaria’s minister-president, the festival is open for business. 4. DON’T ASK FOR AN IPA HERE. ONLY AUTHENTIC GERMAN STYLES MAKE THE CUT. 5. THERE’S MORE TO OKTOBERFEST THAN BEER. BELLY UP FOR SOME SERIOUSLY HEARTY EATS. The best way to buck up your stomach after six million liters of beer? Tuck into 500,000 roast chickens, 120,000 pairs of sausages, 50,000 pork knuckles and an unfathomable number of head-sized soft pretzels. You’ll also be tempted by massive piles of potato dumplings and potato pancakes, sauerkraut and apple strudel. After all that indulgence, save room for a giant gingerbread heart souvenir decorated with endearing phrases and worn as an edible necklace. 6. TRYING TO RUN OFF WITH ONE OF THE OFFICIAL BEER STEINS? THINK AGAIN. You might be tempted to slip one of those iconic Oktoberfest steins or krugs in your bag. Don’t. First of all, the massive one-liter glasses are heavy and difficult to hide. Plus, thousands before you have tried and failed. Security guards are stationed near tent entrances to keep steins from sneaking off. You’ll definitely get caught and slapped with a fine if you try. Better to test your stein-handling skills inside the tent, like the Bavarian waitress who set a Guinness record in 2008 by balancing 19 full beer steins (weighing about five pounds each) and walking across the tent without spilling a drop. 7. FEELING INVINCIBLE? THIS IS THE SIGNAL FOR CHUGGING A FULL LITER OF BEER. If you feel the need to stretch out your legs, beware of placing your foot on the table. That’s the universal sign for preparing to down an entire stein of beer in one go. Once that signal’s thrown, the entire tent (likely around 8,000 to 10,000 people) will be staring you down to make sure you complete the challenge. A traditional form of entertainment, this plan can quickly go awry. If you succeed, prepare to be fully drunk in seconds. If you fail, an audience of thousands will show you no sympathy—and a symphony of boos. 8. GET READY TO SING YOUR HEART OUT. 9. BEER, PRETZELS AND… A CROSSBOW COMPETITION? Need a break from your tiring schedule of chugging beer? Oktoberfest offers a wealth of other activities, many of which are family-friendly (the legal drinking age in Germany is 16 after all). Visitors can wander about the annual Fun Fair, which includes a 164-foot-high ferris wheel, the famous Olympia Looping rollercoaster and log flumes as well as a flea circus and roving street performers. Craving a little more action? Head to the Armbrustschützenzelt tent that has hosted a crossbow competition inside since 1895. 10. CAN’T SWING THE TRIP TO MUNICH? CHECK OUT A FEST NEAR YOU. Oktoberfest doppelgängers turn up in surprising places. You’ll find imitators all over the world, from Brazil and Peru to India, Vietnam and even Palestine. The biggest Oktoberfest outside of Germany? Canada claims that honor with its Kitchener-Waterloo festival that’s been running since 1969. Attracting nearly one million visitors each year, Kitchener-Waterloo is known for its strong German heritage that observes many of Munich’s customs, like liter steins, the official tapping ceremony and Bavarian music and dancing. Not to be outdone, the largest Oktoberfest in the U.S. is hosted in Cincinnati. Zinzinnati lasts only three days, but closes down six blocks of the city with an opening parade, beer stein race and the “Running of the Wieners” dog race that features dachshunds dressed as hot dogs.